Around 7 months ago, I had found myself out of fishing with a neck injury that required surgery. A ruptured disc had bulged enough to irritate the nerves down my left arm. fishing was certainly out of the question, standing for more than an hour could not be done; heck, even sleeping was rough. It was one of the toughest times I have ever encountered. How did I get through it you ask? Well, I always knew that I was down, but not out! Around the tournaments, we always talk about the bass sensing uncertainty, nerves, and negative energy transmitting down the fishing line. Confidence in what you do eliminates the uncertainty and even those nerves. However, the only way to eliminate negative energy is to replace it with positive. When you loose or break a big fish off, stay positive and have the confidence that you are doing the right thing. During a tough bite, be confident that the next move will be the right one and stay positive so that the day doesn't spiral out of control. My outlook has been, and will always be, that positive thinking yields positive results...Tournament fishing here we come! 1st bass from Boat 7 months after next surgery! During the latest Team Davies fishing tournament, Steve and Leah were able to turn a certainly tough day into a successful day. 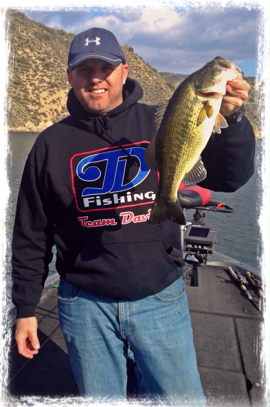 Conditions at Lake Pyramid, CA were unlike any winter fishing day. We are not talking about a winter storm propelling raindrops sideways, we are not talking about ice storms, freezing cold, and slippery decks. This is California in 2014. What we faced during this day was high temperatures in the 70’s, no wind, and ultra-clear water. Team Davies started out with finesse techniques on their rods paired with Pflueger reels and 6 pound Berkley 100% fluorocarbon. As on hour turned into two, Steve decided to pick up an ultra-finesse rod with 4 pound Berkley fluorocarbon line, a Daiichi drop shot’n nose hook, and a 4 1/2” Roboworm. With this subtle change, Team Davies was able to load the boat with a limit in the next two hours. When the day was done, Team Davies was able to boat 8 fish throughout the day and ended up with a 5 fish limit that landed a 5th place finish. The lesson of this day is to let the conditions dictate your decision. Sometimes finesse is just not enough and ultra-finesse is the subtle key to success. Team Davies set out on an overnight trip on the Sea Biscuit. The Boat handled well in the Big Water of the Pacific Ocean. 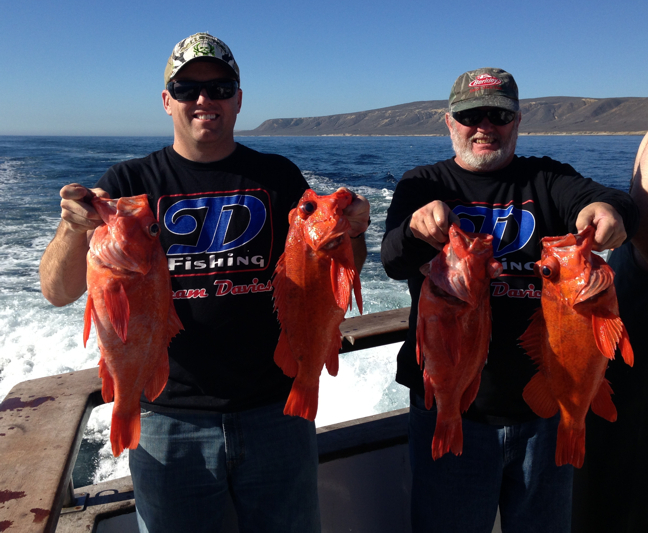 The Captain put us on some spectacular fishing and the boat limited out on Big Reds. The team used Penn Fathom Reels paired with 50# Spiderwire and 20# Berkley Big Game as a leader. This tackle concurred all but a few of the powerful fish it encountered. Although a successful day, the competitors in us do not accept the lost fish. Next trip we will certainly use the same set up, but attach a 25# or 30# leader. The lesson to be learned here is, "Understand your competition and pair your equipment to their strength." Line Breaks in fishing is the failure of the fisherman to control the things that can be controlled. Team Davies learned a very tough lesson during the day but certainly had a blast while learning it! On your next outing, remember the lesson of Big Water, Big Fish, Big Tackle.